Why do I love Eve? CrazyKinux asked a question to all of us Eve bloggers, why do we love Eve so much? That is an interesting question and I thought I would take a shot at answering it. I've never played an MMORG before Eve. I'm not an experienced WoW player and hadn't even considered playing some crazy, social networking, computer platforming, role-playing, massive anything before I first laid eyes on the Eve universe. That moment is burned into my brain even a year and a half later. The exact nano-second I saw Eve I knew I must play it. Do not stop at Go and do not collect two hundred dollars. Now. Eve is unlike anything else. Some days I hate it, some days I want to rip its innards from CCP's servers, some days it is glorious, others it is funny, sad, whatever it is it is very much a living, breathing world of its own. And every day it surprises, annoys, and grabs me like it did that very first day. Love? Oh yes, I suppose one could use that word, but I believe that Eve deserves a more fitting refrain. Love is something reserved for a soul-mate, a family dog, or your actual family. To me Eve is a passion. A romance of dreams. Dreams I've held onto since I was a wee lad and will never let go of. The very first art related piece that I did based on the Eve universe was a small piece that I simply emailed around to my Corp mates, this was well over a year ago. 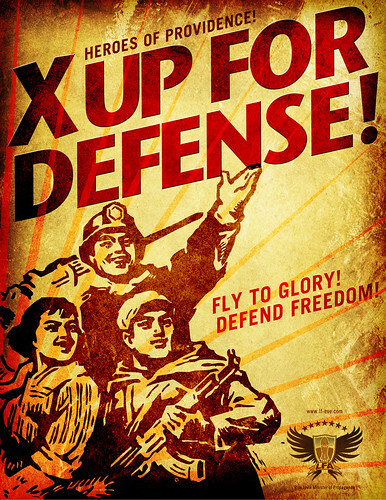 This simple piece of 'propaganda' art was based on a conversation we had during a long Corp mining operation. The concept of "reds" was still new to me at the time, heck it wasn't long before that I thought the NPCs in the belts were reds, and it struck me that no matter who you are someone sees you as being red. An enemy. I'm constantly fascinated by the Universe of Eve. Not only from the player perspective, but from the total picture that slowly unveils itself as you play. The hidden world that really isn't part of the game itself, but is no more important in a "behind-the-scenes" kind of way. The normal citizens, the janitors that clean the stations, the docking managers (The ones we love to hate! Right Scotty? ), and the literally millions of stories in the naked universe. So it didn't take long before I started incorporating such stories into my work. The True Sansha Heart Foundation was an early example. (See previous post) Recently however, I've begun thinking of incorporation in a different way as well, the installation of Eve related items, such as spaceships, into photography. 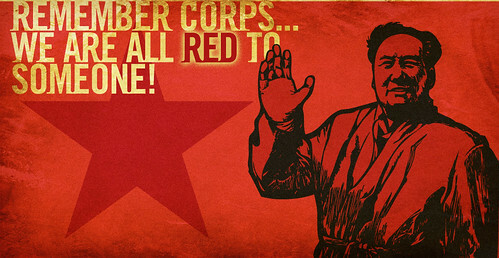 A more photorealistic approach, than the WWII inspired propaganda that I started out with. 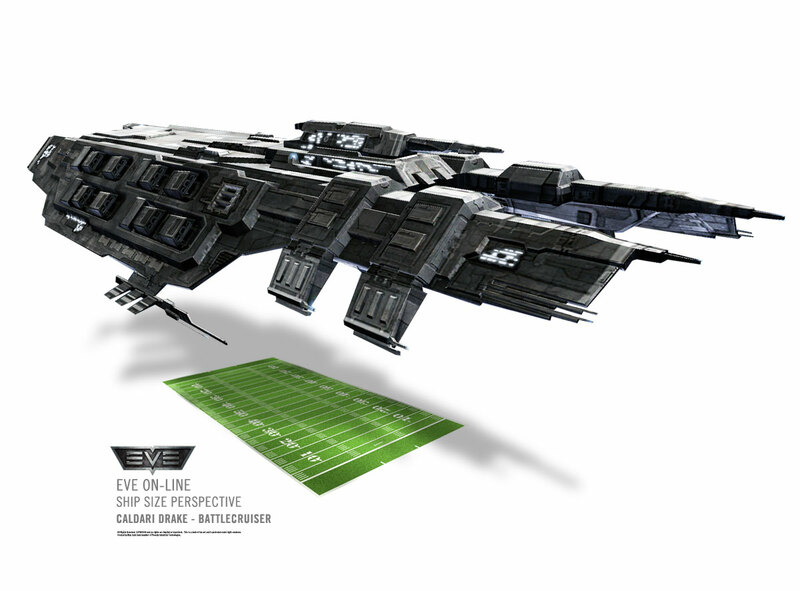 The challenge is certainly one of scale, most spaceships in Eve are simply HUGE. As such they provide little real opportunity to relate to a human scale, when a Titan is the size of Manhattan, people would be like ants. That particular challenge is one I am still thinking about. But there are opportunities to be had, and this more recent example is one of the first I attempted. I was taken with the idea of in-station repair services. In the game they happen quickly, but there must be people involved in those repairs. Mechanics that work on your damaged ships? Perhaps. But, if so, they must be a hardy bunch and perhaps - like in real life - getting good mechanics isn't easy. The Manticore provided a good "human scale" ship to use as my subject. And while I took artistic license with the scale, it is close enough for the purpose. I am particularly proud of this piece, it took several hours of work to achieve, to remove the woman and the hangered airplane from the original photo and to treat them all in a way to get the most realistic look that I could. As in all art, eventually you must abandon the effort. More work may have achieved more realism, but how much more? This piece is available as a 1920 x 1200 desktop image that you can download by clicking HERE. Or a 1024 x 640 version you can download by clicking HERE. Here is the original photo so you can see the amount of work that needed to be done. © PHOTO is copyrighted and all rights are reserved. Presented here for fan art purposes only. I do sometimes create work on commission, it isn't something that I actively pursue but it does keep things interesting and generate some amount of in-game currency for me. Which is always a good thing. The information for contacting me is given in the right sidebar, so feel free to shoot me an email with your request. My prices are extremely reasonable given the amount of time it takes me and the quality of the work (imo). 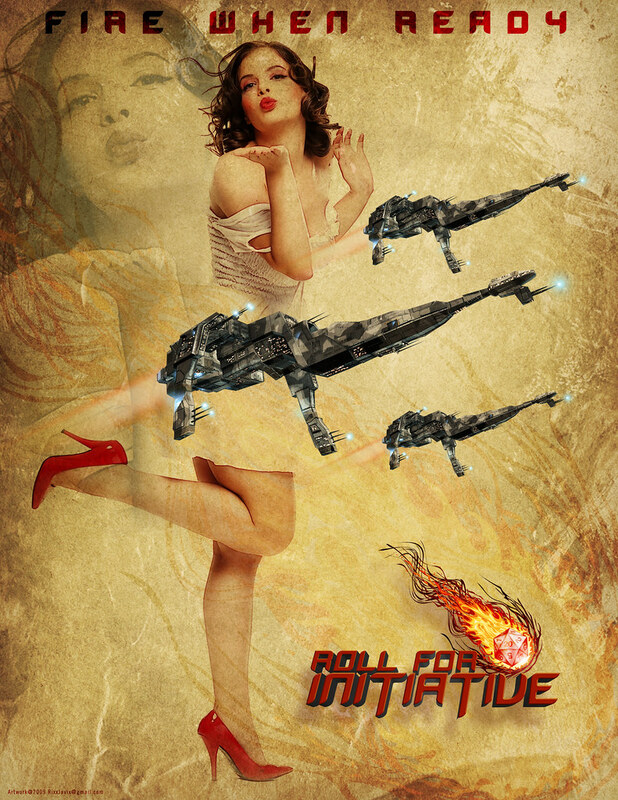 One of the commissioned works I completed was for a Corporation or Alliance called Roll For Initiative. They asked me for a Corp logo they could use out-of-game (sadly not much we can do about the in-game versions) and a recruitment poster. They had some very specific ideas about what they wanted, which is cool with me and helps get the concept rolling. It is a process that involves both parties, although I have to keep the amount of revisions to a minimum or charge more for them. This one went very smoothly and I think everyone was happy with the results. You can see a bigger version of the poster by clicking HERE. I'd like to say howdy to all my UK friends who are dropping by today. Obviously I can't see you, since you are all cloaked up in your Vagas, but welcome anyway. This site is real world and not in-game, so we're all friends here. The fact is that Eve itself is a work of art. The game is incredibly beautiful, especially now with the planetary and star field updates. I know that sometimes I take what's going on around me for granted, the ease at which this immersive and surrounding universe envelopes you is such a daily happening, that it can be easy to take it for granted. So every once in awhile I'd like to publish a screen capture and tell you a bit more about the story behind it. This is a -A- Avatar Titan parked in a POS in the F4R system. The pilot was Jenna Trueman and it had just arrived about twenty minutes earlier. I know this because I was on a Covert Ops mission deep in enemy territory and had been for several days when I saw this beast pop up on my scanner. This particular Titan and its pilot had been giving us trouble during the previous few weeks and only a week before had doomsday'd yours truly, an attack I survived thank you very much. So when I saw this thing pop up on my scanner I decided to take a closer look. Local had jumped to about 200 pilots so I figured a large -A- fleet had arrived. It didn't take long to scan down the Titan and the POS. The Titan was safely behind the shields along with about 150 other red ships. So, in my infinite wisdom, I decided to see how close I could get without being detected. I was flying my trusty paper-thin Manticore and fully cloaked. I had also been in system for several hours so they had gotten used to me being there and probably thought I was AFK. So I started slow boating towards the Titan and the large, coming and going, red fleet. How close could I get? The trick being to stay out of de-cloak range of the POS modules, the orbiting ceptors, the warping and arriving ships and any other "invisible" cloaked ships that were probably around. Not an easy task. If I was discovered I would most likely be killed, podded and back home in Providence rather quickly. It took me thirty minutes to manage to get within 20k, which is when I paused to take this screen-shot. Luckily for me the Titan happened to be rather close to the shields and I finally managed to get within 4k of the monster. Undetected. No time for a screen-shot, I made a quick joke about it in local and warped off to a safe spot. You can see the full-size capture by clicking HERE. 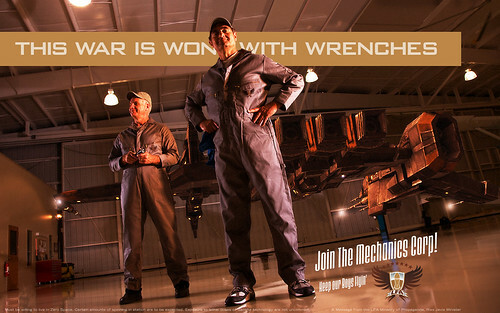 My LFA Propaganda poster above is featured in the New issue of EON, page 3 full-page!! Yee! They even published another one I did on the page about LFA. Pretty awesome. One of my newer posters got picked up by an Eve Propaganda site! I wasn't going to talk about that poster until much, much later in the blog, so I'm still not gonna. 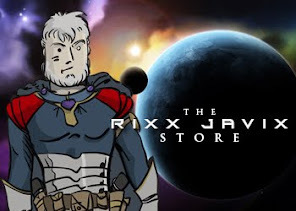 Until then, here is a small thumbnail of the poster. One of the many things I do for a living in real life is create identities for companies, sports teams, charities, just about any type of organization you can think of. 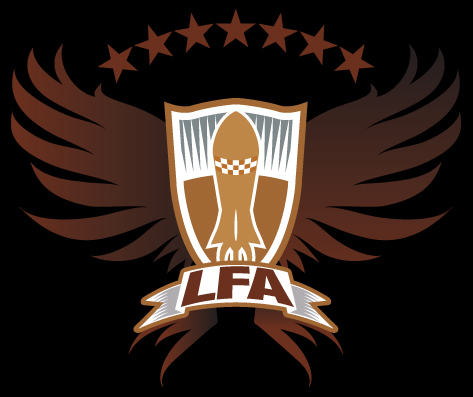 So last year when it was announced on the LFA Forum that they wanted a new Alliance logo, I obviously jumped at the chance. Creating an identity for an in-game Alliance isn't as easy as it sounds. And strangely enough, my professional background was a huge disability for me. That might seem like a strange thing to say, surely my experience was an asset? Well sorta. The possible problem was that the process was going to be decided by popular vote, an open poll "Round Robin" to be held on the Forum. While I certainly agree that was the best way to handle the process, it does leave open the aspect of public opinion. And public opinion can be very fickle. It can also often demonstrate really, really bad taste. Believe me, I've sat through thousands of hours of focus groups to know that fact all too well. I needn't have worried however. After getting off to a slow start, I realized that the open forum actually helped me tremendously. Mostly because I was able to gauge opinion as the process proceeded and adapt what I was doing accordingly. This is where my experience did come in handy. And while the final logo isn't exactly what I would have chosen, it remains something I am proud of. Mostly because it manages to retain the tongue in cheek humor that I love, while also remaining one of the better Alliance logos in Eve. In my humble opinion at least. Sadly, despite having been incorporated last Summer, the logo itself has not yet been incorporated into the game itself. I was hoping that it would appear after the patch yesterday, but it hasn't. I remain hopeful that it will show up someday soon surrounding the TCU's in our systems. I have a lot of catching up to do in these posts, so they won't be following any sort of chronology and will probably skip around a bit. I'm basing what I write purely on what interests me when I sit down to write, so you never know what you might get. Today I thought I'd talk about the creation of the LFA Ministry of Propaganda and how that came about. For those that might not know Libertas Fidelitas is an EVE Online Alliance that occupies space in the Providence region of the Eve Universe. LFA is part of a larger coalition of Alliances under CVA charter. 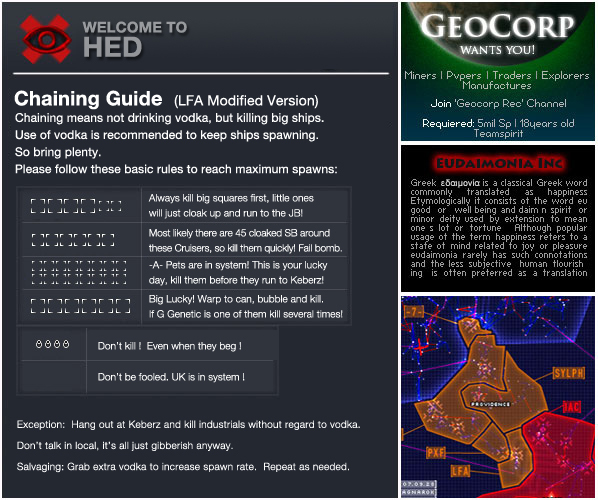 Blah blah, the important thing is that I have been a part of LFA since shortly after I started playing Eve. Despite several attempts to leave and do other things, I always end up coming back. I'm sure I'll be writing more about that as I go along, for now that should suffice to establish the story. I had been creating Eve based fan art sporadically up until early last Summer. Mostly because I didn't really have a focus and it was more of a "I'm bored, now what?" kind of motivation. So, in my infinite wisdom, I decided to create a job for myself. Why not establish a totally fabricated position within the Alliance and see how it goes. Give myself a job in other words. 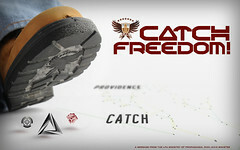 Out of that thought came the idea for the LFA Ministry of Propaganda with myself as the Minister of Propaganda. Now it would be up to me to create Alliance focused Propaganda campaigns (purely for the fun of it) to motivate, inspire and otherwise have fun with the Alliance and its members. All of the art I created for the Ministry was presented to the Alliance on our Forum and isn't available to the public at large. Which is yet another reason I created this blog, to be able to share my work with others. The Alliance took to my work and Alliance leadership was very supportive. I had feared that they might not take well to my assumption of a position, albeit one totally fictional, but they enjoyed the idea. The poster below was the very first one I produced under the title, the poster happened to coincide with the creation of the new LFA logo (which I will talk about in the next post) and was a general call to arms. It remains one of my favorites. I haven't received the new issue of EON yet, but I believe this poster appears in that issue alongside the article about LFA. It should be arriving soon. You can view a larger version of the above image by clicking HERE. One of the many ways to make money in Eve is by "ratting". Essentially this boils down to the slaughter of countless NPC characters that happen to live within the space you are in. There are many different races of these "rats" throughout the Eve universe and which one you happen to encounter depends on your location. In the time I've spent in Eve I've destroyed thousands of these aliens. The process isn't difficult and can often be a bit boring to be honest, so you have plenty of time to think, or actually do something productive. I remember thinking at one point about those whose ships I was exploding. Did they have families somewhere back home? Was someone worried about them and waiting for them to come home for dinner? Did Liberal minded citizens of Eve care about those families and children left behind by the devastation that I was helping to bring? Probably. And, if so, would they hire an advertising agency to create a campaign to bring awareness of these Sansha Families to light? Sure, why not. And if they did, this would be the first ad in that campaign. You can see the full-sized version by clicking HERE. Enjoy. I'm an artist and I play Eve On-line. If you are not familiar with Eve then I suggest you visit this link. Eve is an MMORG, a Massive Multi-player On-line Role Playing Game that at any one time can have upwards of 50,000 people from around the world playing together at once. It is also an Internet Spaceship game. A complete waste of time and horribly addicting. I actually don't get to play much, but I try to grab some time here and there. It also happens to be an incredibly beautiful experience. 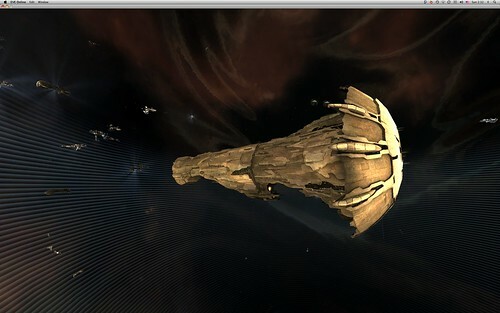 The 3D graphics, the environments, ships and other things to be found within Eve are amazing. As an artist, a writer, a brand builder and an advertiser my interest in Eve is purely from the fan's perspective. But about a year ago I started wondering if I could combine the multiple aspects of my interests into Eve somehow. At first it started as a simple desire to take some of the art from the game and incorporate it into simple relationships. But that quickly evolved into something else. Now I create an on-going series of pieces under the guise of the "Minister of Propaganda" for one of the game's many Alliances. If you're not familiar with the game, it is pretty hard to explain. Players form groups called Corporations, Corporations form groups called Alliances. These Alliances can hold Star Systems, in which they mine and produce industry and must also defend against other Alliances. That's the quick version. As the artwork I produced started to add up I began to think about putting it somewhere, and that is where this blog comes in. A place to put the art I do for Eve and a place to talk about the game, how the art came to be, and anything else I can think of. We'll see how it goes. One of the first pieces I did was the above "Size Relationship" of the Caldari Drake. Within the game itself it is difficult to get an idea of the size of your ship in relation to the real world. All you have to compare it to is other objects within the game. Luckily, each ship does come with a size and it was easy enough to convert that to something that I could identify with. In this case an American Football field. I took that a step further in another similar chart I did, but I'll leave that to another time. You can view a larger version of the image HERE.